How is Myrrh Made and What is it Made of? Myrrh is a special mixture of oils, herbals and fragrant tars (more than 50 ingredients). In the Old Testament, the Tabernacle, archpriests, prophets and kings were anointed with it. The myrrh bearing women were heading to the Christ’s tomb with that very myrrh. 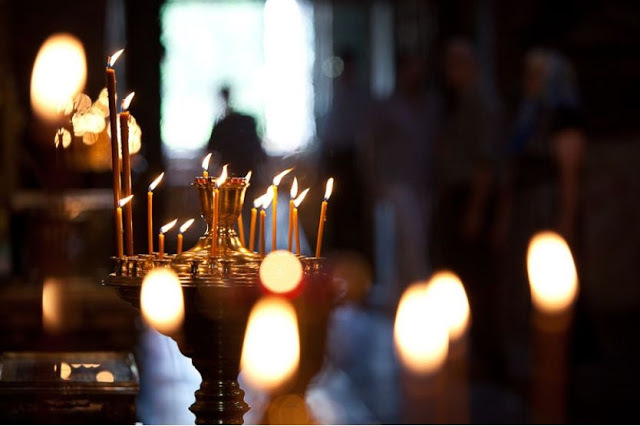 People are anointed with it during the Sacrament of Chrismation in case when people of other faiths are going to accept Orthodoxy. Besides, myrrh is used in consecration of the altars of newly built churches. The Sacrament of Chrismation goes back to the apostolic times. In the ancient Church every newly baptized person received the blessing and the gift of the Holy Spirit through the laying on of the hands of an apostle or a bishop. Later, when the number of Christians began to increase and it became too difficult for every newly baptized person to meet with a bishop, that rite was changed on the Sacrament of Chrismation. Priests can only anoint people with the myrrh, while bishops are allowed to prepare it. Only the head of the autocephalous church (patriarch, metropolitan) has the right to prepare myrrh. 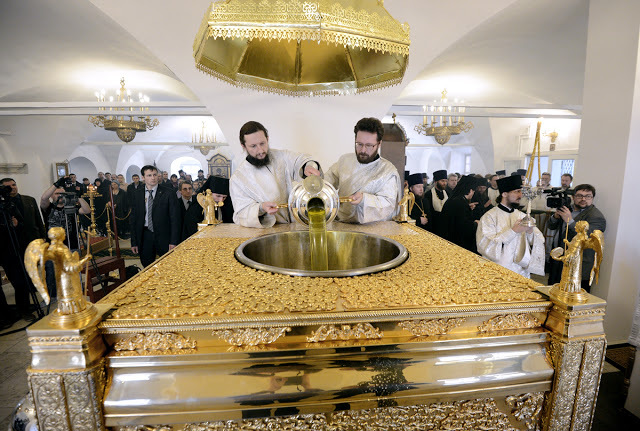 In Moscow, the Patriarch performs the rite of preparation of myrrh once every several years and then he sends the consecrated myrrh to different parishes. 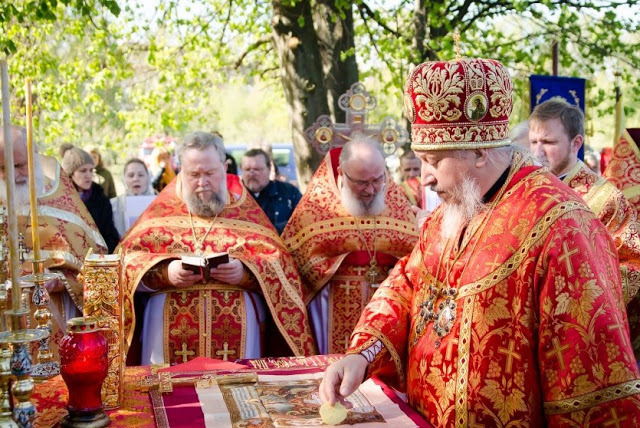 Thus, anyone who becomes the member of the Church receives the blessing of the Patriarch. Even prophet Moses, following God’s orders, poured myrrh on the head of his brother Aaron, when he proclaimed him the archpriest of Israel. Prophet Samuel did the same to Saul and David when he anointed them before enthronement. Archpriests and kings by law and prophets by God’s will received that mysterious anointment from other prophets or archpriests as a sign of the Holy Spirit descending on them, which let the clerics celebrate divine services and the prophets speak. The Hebrew word Messiah and the Greek word Christ means the Anointed. That title was given in its triple meaning to the Son of God, Who appeared on earth in the image of the Son of Man: it was given as to the prophet of the Heavenly Father, as to the King of Israel and the Universe from the tribe of David and, finally, as to the Archpriest of God, Who willingly sacrificed Himself for the sins of the whole world. The rite of preparation of myrrh begins during the Week of the Cross during the Great Lent. It begins with choosing the ingredients. On the first day of the Holy Week the clergy gathers in a special chamber where silver boilers and vessels are prepared. The Patriarch blesses to begin prayers, consecrates Holy Water and blesses all the ingredients from which myrrh will be made with the Holy Water. 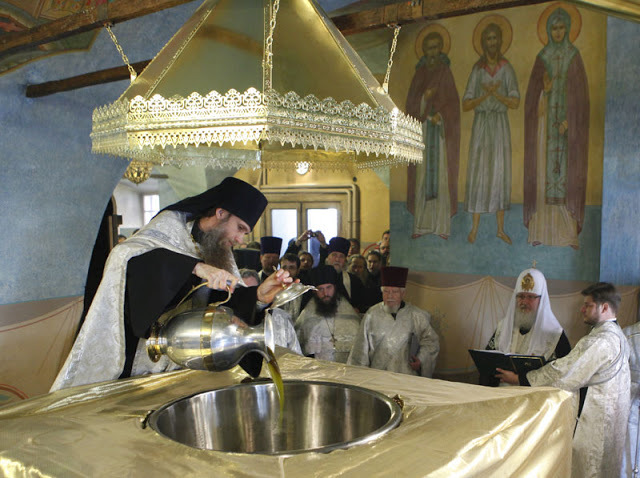 He pours water into the boilers, while the priests pour wine and oil and put burning coals. After a short prayer to Jesus Christ before the beginning of any task, the Patriarch leaves the deacons and priests who will continue boiling myrrh for three days constantly reading the Holy Gospel. On Great Wednesday various flavors are put into myrrh, and then it is poured into twelve large vessels, which correspond to twelve apostles. The consecration of myrrh occurs during the Liturgy on Great and Holy Thursday. 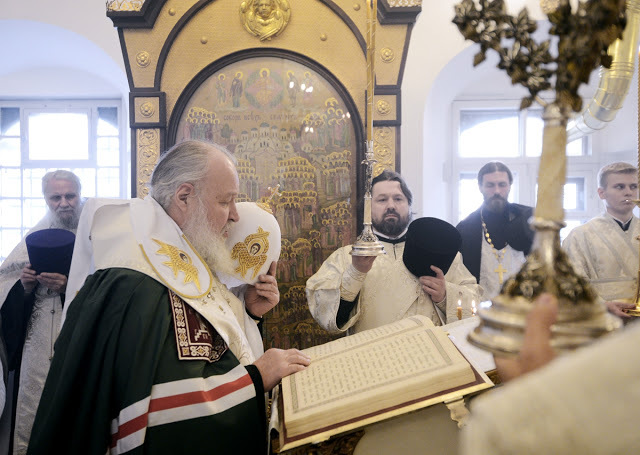 Before the reading of hours, the Patriarch and the clergy bring the vessels with myrrh from the chamber to the church altar and put them around the table of oblation. This festive transportation of the twelve vessels repeats during the Great Entrance before the Holy Sacraments, because myrrh should be consecrated on the holy table as well. The older archimandrite or bishop goes ahead and carries a precious alabaster vessel full of myrrh under two rhipidions just like under the wings of cherubims. It reminds about the alabaster with the myrrh, which was poured by the repentant wife on the head and the feet of the Savior. Other vessels are carried after the bishop and then placed on the sides of the holy table. 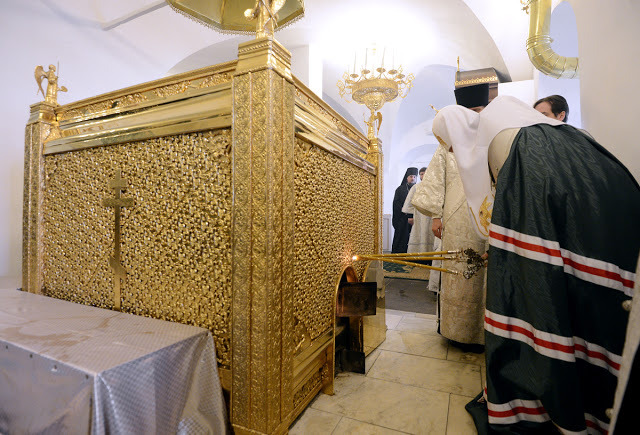 The Patriarch takes the first alabaster in the Holy Doors and puts it on the holy table. When the consecration of the Holy Sacraments should occur, the Patriarch opens each vessel and blesses it with a sign of the cross in the name of the Father, the Son and the Holy Spirit. Then the Patriarch pronounces out loud the prayer of myrrh consecration, appealing to the Merciful Lord and the Father of light, “As Thou gavest to Moses Thy faithful minister, to Thy servant Samuel, and to Thy holy Apostles, so also, despite our unworthiness, give to us the grace to serve this great and life-creating Mystery. Send down Thine all-holy Spirit on this myrrh. Make it the anointment of kings, the spiritual nourishment, the preserver of life, the sanctification of souls and bodies. Make it the oil of gladness which was prefigured in the Law and shone forth in the New Testament”. He prays that everyone who goes through Baptism will be recognized as the citizens of the Heavenly Kingdom and be frightful for demons; that they become the chosen people, the royal clergy, the holy people registered by the sacrament and carrying the image of Christ in their hearts. The Patriarch addresses the people and wishes peace to all and after the deacon’s appeal to bow, he returns to the holy table and thanks God, Who has granted him the grace of serving. After the prayer to the Holy Trinity, he blesses three times each vessel with a sign of the cross. 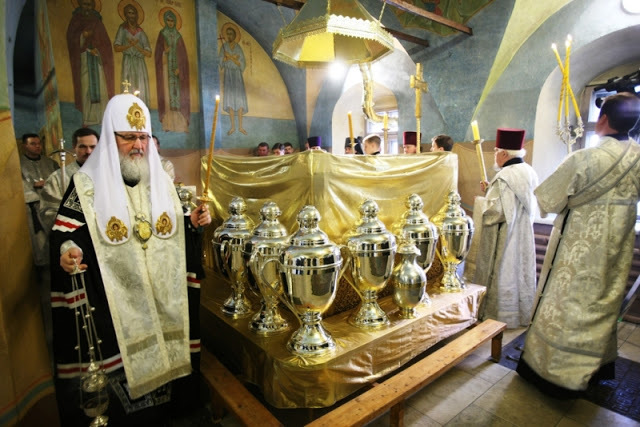 After the Liturgy the vessels are brought to the storage while singing the psalm “My heart is overflowing with a good theme…”, which mysteriously depicts anointment and the glory of the Son of God. All these prayers and actions of myrrh consecration refer to the Sacrament of Chrismation because only bishops have the highest power to seal Christians in their faith following the example of apostles. Myrrh is consecrated for the whole Church so that later priests can perform the sacrament and tell people about the blessed gift of the Holy Spirit. Holy Myrrh flows over the whole Church from one source to another and maintains the inviolable union of peace by the seal of the name of Christ. stirring myrrh with paddles. The consecration of myrrh is performed by the Patriarch on Great Thursday during the Liturgy. It occurs after the Eucharistic canon when the Royal Doors are open. Can Anyone Be Saved Without Going to Church? May a Service Be Held Outside of a Church? What Does One Need for That?